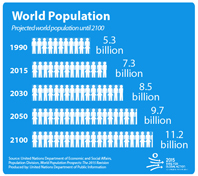 The current world population of 7.3 billion is expected to reach 8.5 billion by 2030, 9.7 billion in 2050 and 11.2 billion in 2100, according to the “World Population Prospects: The 2015 Revision”, launched on 29 July. “Understanding the demographic changes […], as well as the challenges and opportunities that they present for achieving sustainable development, is key to the design and implementation of the new development agenda,” said Wu Hongbo, UN DESA’s Under-Secretary-General. Currently, among the te n largest countries in the world, one is in Africa (Nigeria), five are in Asia (Bangladesh, China, India, Indonesia, and Pakistan), two are in Latin America (Brazil and Mexico), one is in Northern America (USA), and one is in Europe (Russian Federation). Of these, Nigeria’s population, currently the seventh largest in the world, is growing the most rapidly. Consequently, the population of Nigeria is projected to surpass that of the United States by about 2050, at which point it would become the third largest country in the world. By 2050, six countries are expected to exceed 300 million: China, India, Indonesia, Nigeria, Pakistan, and the USA. With the highest rate of population growth, Africa is expected to account for more than half of the world’s population growth between 2015 and 2050. “The concentration of population growth in the poorest countries presents its own set of challenges, making it more difficult to eradicate poverty and inequality, to combat hunger and malnutrition, and to expand educational enrolment and health systems, all of which are crucial to the success of the new sustainable development agenda,” said John Wilmoth, Director of UN DESA’s Population Division. While there is always some degree of uncertainty surrounding any projection, the large number of young people in Africa, who will reach adulthood in the coming years and start having children of their own, ensures that the region will play a central role in shaping the size and distribution of the world’s population over the coming decades. Future population growth is highly dependent on the path that future fertility will take, as relatively small changes in fertility behaviour, when projected over decades, can generate large differences in total population. In recent years, fertility has declined in virtually all areas of the world, even in Africa where fertility levels remain the highest of any major area. The slowdown in population growth, due to the overall reduction in fertility, causes the proportion of older persons to increase over time. 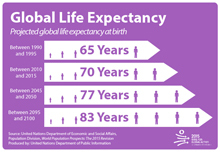 Globally the number of persons aged 60 or above is expected to more than double by 2050 and more than triple by 2100. A significant ageing of the population in the next several decades is projected for most regions of the world, starting with Europe where 34 % of the population is projected to be over 60 years old by 2050. In Latin America and the Caribbean and in Asia, the population will be transformed from having 11% to 12% of people over 60 years old today to more than 25% by 2050. Africa has the youngest age distribution of any major area, but it is also projected to age rapidly, with the population aged 60 years or over rising from 5% today to 9% by 2050. Life expectancy at birth has increased significantly in the least developed countries in recent years. The six-year average gain in life expectancy among the poorest countries, from 56 years in 2000-2005 to 62 years in 2010-2015, is roughly double the increase recorded for the rest of the world. While significant differences in life expectancy across major areas and income groups are projected to continue, they are expected to diminish significantly by 2045-2050. Progress in reducing under-five mortality, one of the Millennium Development Goals (MDGs) targets, has been very significant and wide-reaching in recent years. Between 2000-2005 and 2010-2015, under-five mortality fell by more than 30% in 86 countries, of which 13 countries saw a decline of more than 50%. In the same time period, the rate decreased by more than 20% in 156 countries. Populations in many regions are still young. In Africa, children under age 15 account for 41% of the population in 2015 and young persons aged 15 to 24 account for a further 19%. Latin America and the Caribbean and Asia, which have seen greater declines in fertility, have smaller percentages of children (26 and 24 %, respectively) and similar percentages of youth (17 and 16%, respectively). In total, these three regions are home to 1.7 billion children and 1.1 billion young persons in 2015. These children and young people are future workers and parents, who can help to build a brighter future for their countries. Providing them with health care, education and employment opportunities, particularly in the poorest countries and groups, will be a critical focus of the new sustainable development agenda. 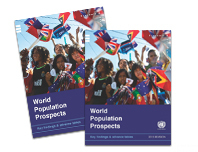 The 2015 Revision of World Population Prospects is the 24th round of official UN population estimates and projections that have been prepared by UN DESA’s Population Division.